I like beer, especially distinctive and flavorful craft brews, and I’m an environmentalist. So I was disappointed to learn that the beer-brewing process is incredibly water-intensive, using six to eight gallons of water for every gallon of beer produced. Fortunately, some green-minded brewers are finding ways to reduce their water use, as well as to conserve energy and other resources. 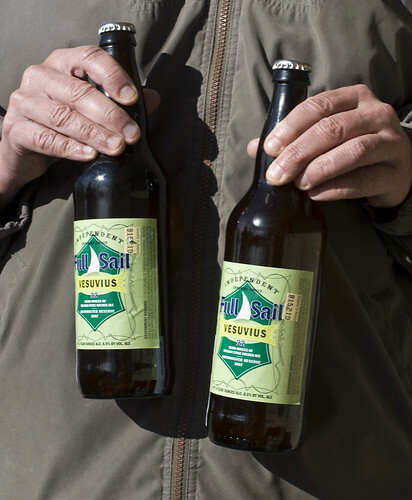 Sustainable Industries reports in its February issue that Full Sail Brewing in Hood River, Oregon, the nation’s ninth largest craft brewery, has taken on water conservation with great zeal, reducing its water use to just 3.45 gallons for each gallon of beer brewed. The brewery also operates on a four-day workweek to cut down on water and energy use. “We’re dedicated to operating our brewery in the most socially and environmentally sustaining manner possible, while producing world-class ales and lagers of the highest quality,” Full Sail’s website states, throwing in a nod toward the Columbia Gorge area’s natural beauty: “Let’s face it—without this heavenly environment, there would be no heavenly brews.” Read more on the “Responsibility” page of the Full Sail website. Since I live in the Midwest, near the Great Lakes watershed, I was encouraged to see that many brewers in the Great Lakes region attended an event last October, the Great Lakes Craft Brewers and Water Conservation Conference, that’s been called the first independent gathering to bring together craft brewers, policymakers, and nonprofit organizations to discuss water conservation. A blogger known unfortunately as the Beer Wench, Ashley Routson, wrote about the conference and the underlying water resource issues. Despite Routson’s limited grasp of environmental issues—she states that water shortages and global warming “are extremely controversial and both are disputed,” which sounds like Denial Inc. talking—she nonetheless compiles some enlightening statistics about declining worldwide water supplies. How does the green-beer discussion affect my world? Well, I often drink a local craft brew, Summit Extra Pale Ale, in part because it’s a great beer and in part because I don’t like to buy brews shipped across the country or the world, a carbon-intensive undertaking. (Eat locally, drink locally.) But I don’t see any evidence of environmental consciousness on Summit’s website, let alone in its beer packaging: The 12-pack cartons that hold the best-selling Extra Pale Ale don’t boast of recycled content or even indicate their own recyclability. However, I was encouraged to catch a glimpse of Summit owner Mark Stutrud in a YouTube video report from the Great Lakes conference. Perhaps he was taking notes and is about to unveil some great new green initiatives. In the meantime, I think I’ll pick up a six-pack of Full Sail as a vote of confidence with my wallet. The next Great Lakes Craft Brewers and Water Conservation Conference will be held October 18 and 19 in Milwaukee and Plain, Wisconsin. Image by wickenden, licensed under Creative Commons.